Two decades have passed since two of Africa's poorest countries began the continent's deadliest border war. 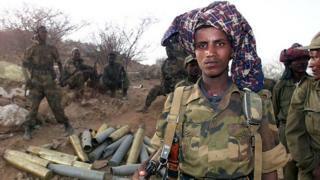 The conflict between Eritrea and Ethiopia left tens of thousands dead or injured in the space of just two years. But despite a peace deal signed in December 2000, the two sides remain on a war footing - their massive armies still facing off. So what happened 20 years ago to spark Africa's unfinished war - and what hope is there that it might finally come to an end? The war began on 6 May, 1998, sparked by a battle for control of the border town of Badme - a humble, dusty market town with no apparent value. It had neither oil nor diamonds, but it did not matter: both Eritrea and Ethiopia wanted it on their side of the border. At the time, the war was described as "two bald men fighting over a comb". As the war spread, so did the massive displacement of communities. "This war destroyed families on both sides," recalls Kasahun Woldegiorgis, who comes from the Ethiopian town of Adigrat, close to the border. "We are intermarried across the border and we cannot attend each other's weddings or funerals," says Asgedom Tewelde, who comes from Zalambesa, a town once divided in two by the border. "There was a family from a village called Serha on the Eritrean side of the border and their daughter married someone on the Ethiopian side. Later, after the war, she died, but her family could only see the funeral procession from a hilltop across the border." It was not just family ties: the economic impact on the border trading communities was significant too. "The active commercial activities that we used to see before the war no longer take place," says Kiflom Gebremedhin, from a border village on the Eritrean side. The war ended in June 2000, but it was another six months until a peace agreement was signed, establishing the Eritrea-Ethiopia Boundary Commission. It was meant to settle the dispute over Badme once and for all. But its "final and binding" ruling 18 months later, awarding Badme to Eritrea, was not accepted by Ethiopia without the preconditions of further negotiations with Eritrea. Eritrea, in turn, refuses to talk to its former ally until the ruling is adhered to. With neither side budging from their respective positions, peace between them remains elusive. Border skirmishes continue - either directly, or through rebel groups acting on their behalf. All the while, Badme remains in Ethiopian hands. And there have been other, bigger implications for the two countries - and the wider world. Eritrea says it needs a constant large army due to the "continuous occupation of Eritrean territories by Ethiopia" - and it feeds that army with compulsory national service. However, what was originally designed to last for only 18 months can last indefinitely. For many of those who don't want to enlist, the only way out is to flee. Why do so many people want to leave Eritrea for Europe? Today, they crowd into large refugee camps in Ethiopia and Sudan, or risk their lives to trying to reach Europe through the Sahara Desert and over the Mediterranean Sea. Eritreans make up one of the largest groups attempting to make the crossing, despite the fact many have died, drowning in the treacherous sea, or falling victim to militants and traffickers who control the route. Eritrea also uses the conflict with Ethiopia to justify suspending the constitution, banning free press and quashing any dissent. During a crackdown in 2001, many of the editors and journalists of the fledgling private newspapers were detained. At the same time, prominent leaders of the ruling People's Front for Democracy and Justice (PFDJ) who criticised President Isaias Afewerki's handling of the war and his reluctance to be accountable, were also detained. Their whereabouts remains a mystery to this day. Political prisoners never appear before courts and visitations are not permitted. Government officials accuse those detained of endangering the country's "national security". Eritrea is accused by the UN Human Rights Commission for serious violation of human rights violations, including possible crimes against humanity. Meanwhile, Ethiopia, which is also accused of human rights abuses, appears more concerned with internal political instability than the border town of Badme. It has recently declared a state of emergency, in an attempt to quell protest movements across the country. But could the stand off over Badme finally be coming to an end? The newly elected Ethiopian Prime Minister, Abiy Ahmed, has called for a peaceful resolution of the impasse and extended an olive branch for talks to the Eritreans, who dismissed the offer as similar to those made by previous Ethiopian leaders. "Peace will indeed be beneficial to the two peoples but obviously, this must be predicated on respect of international law, which Ethiopia continues to flout to-date," Minister of Information Yemane Gebremeskel said. However, the recent visit by Donald Yamamoto, the US acting Assistant Secretary of State, to Eritrea for the first time in a many years has added to the renewed hope. He also travelled to Ethiopia on the same visit. "The people are demanding peace on both sides and it is good to hear that political leaders are talking of peace now," Eritrean Kiflom Gebremedhin says. "I am sure the people will put pressure on their governments and secure peace and return to their normal relations." Over the border in Ethiopia, Kasahun Woldegiorgis is also hopeful. "We believe this road [to Asmara] will not remain closed for ever," he says. You can now get the latest BBC news in Afaan Oromo, Amharic and Tigrinya. Video Why do so many people want to leave Eritrea for Europe?